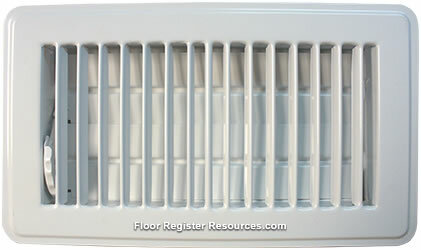 4 X 10 Stamped Steel Floor Register - White Discounts Apply ! White register covers have a durable powder coat finish to inhibit rust and scratches. This 4 x 10 louvered vent has an operational steel damper that is easily adjusted with your foot. White register covers work well with most styles of decorating. Louvered vents are crafted of heavy gauge steel and reinforced at the seams. White register covers install by simply dropping into the duct work. Louvered vents are well made and can be used for heating as well as cooling. ***Hint: The industry standard is to order white register covers using the actual hole opening size and not the faceplate size. This classic white louvered vent will fit a 4 x 10 inch hole opening. Louvered vents can be purchased in many sizes and also with a medium tan finish. Order your new white register covers today for an updated look right away!